Orientation will bring large crowds, including vehicular and pedestrian traffic. Managing these crowds requires careful planning. For the most convenient parking option, we strongly suggest pre-purchasing parking to have guaranteed access to Brazos Garage, located near Jester. If you purchase your parking at least 24 hours in advance, you are guaranteed a space, are guaranteed the lowest rate, avoid purchase lines, and get into the garage quicker with your credentials already in hand. The University of Texas at Austin is a controlled campus that requires a permit to enter. If you only need access to drop off on the first day of orientation and to pick up on the final day of orientation, permits must be acquired online PRIOR to arriving on campus. Drop-off and pickup times are limited to two hours. These permits are $6 plus service fees and will allow for access to Brazos Garage, near Jester, for the first and third days of orientation. If your pickup or drop-off only requires 30 minutes or less, you can pull a ticket upon entering Brazos Garage, no pre-purchase necessary. Parking under 30 minutes is at no charge. Before leaving, proceed to the Brazos Garage office on Level G to have your ticket processed. If you exceed 30 minutes, the regular Garage Daily Rates apply. All drop-offs and pickups are in the Brazos Garage including taxi and rideshare. No curbside drop-offs/pickups are permitted. With heavy vehicle and pedestrian traffic, controlling drop-off and pickup parking will allow for better control and safety for those participating in orientation. Parking on campus requires a permit or payment of a daily fee in one of the twelve parking garages located across campus. 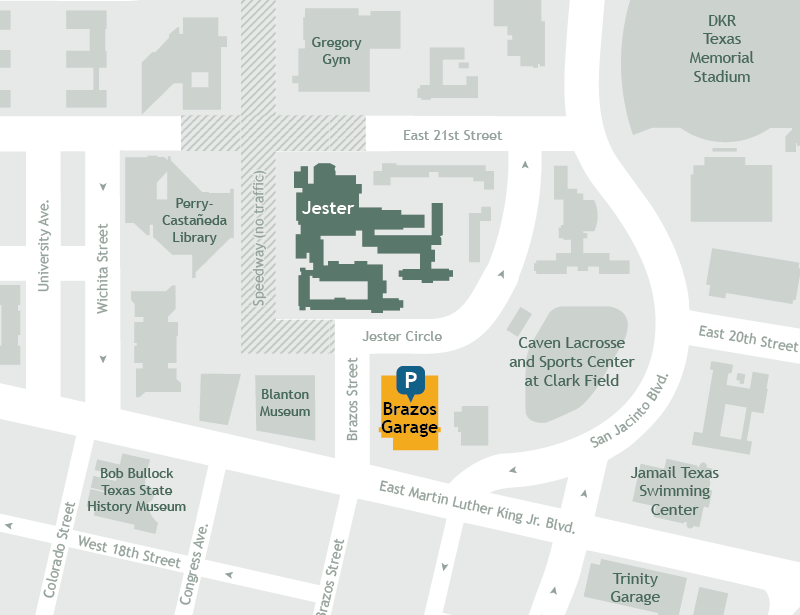 You can purchase parking for the duration of transfer orientation in the Brazos Garage, located directly across from Jester, where your orientation will be held. If your family member is attending transfer family orientation and parking in a garage for one day, a one-day parking pass is available for purchase. For the most convenient parking option, we strongly suggest pre-purchasing parking to have access to Brazos Garage, located near Jester. If you purchase your parking at least 24 hours in advance, you are guaranteed a space, are guaranteed the lowest rate, avoid purchase lines, and get into the garage quicker with your credentials already in hand. If you wait to purchase parking less than 24 hours before orientation, parking will be sold at the Event Parking Rate. If you do not purchase a parking or drop-off/pickup permit, you will not be able to park, load, or unload passengers or luggage, or be granted vehicular access anywhere on the UT campus during orientation with the exception of parking 30 minutes or less in the garage. If you forget your permit, you will be able to download it from a smart phone if you have created an account, even on the day of arrival. Should you not have a smart phone and you forget your permit, please inform the staff at the gates and/or proceed to the Brazos Garage office on Level G for assistance. If your plans change, YOU WILL HAVE THE ABILITY to alter the parking choices you make today, provided you make changes at least 24 hours in advance of your orientation session. If you need to alter your parking choice and you did not create an account upon purchase, email is the quickest way to get a response within 24 hours: pts-orientation_parking@austin.utexas.edu. If you are calling, please allow up to 72 hours for a response during normal business hours (M-F 8 a.m.-5 p.m.): 512-471-7275. We will do our best to accommodate your changes. If you have issues with your Parkmobile account, contact Parkmobile customer service at 866-330-7275. We highly recommend that you DO NOT exit at 5 p.m. as areas surrounding campus will be in typical rush-hour gridlock. Stay late for the BBQ or entertain yourself on campus until 6:30 p.m. or 7 p.m. Traffic will be lighter, and your all-around experience will be more enjoyable. If you’re flying into town, Capital Metro’s Route 20 (Manor Rd/Riverside) offers rides between campus and the Austin-Bergstrom International Airport. The easiest way to get directions to the Jester and Brazos Garage area is to type "Brazos Garage" into your smartphone map app. Take the Martin Luther King Jr. Boulevard (MLK) exit. Turn onto MLK heading west. Turn right onto Brazos St. Follow signage to direct you to parking or pickup/drop-off locations. Take the Windsor Road exit heading east. Turn right onto Windsor Rd/ 24th Street. Turn right onto N Lamar Blvd. Turn left onto Martin Luther King Jr. Boulevard. Turn left onto Brazos St. Follow signage to direct you to parking or pickup/drop-off locations. From the north, take MoPac southbound and follow directions for MoPac listed above. From the south, take Airport Boulevard northbound to Martin Luther King Jr. Boulevard (MLK). Turn left onto MLK. Turn right onto Brazos St. Follow signage to direct you to parking or pickup/drop-off locations. Our campus is very large, and parking spaces are an extremely limited commodity for the thousands of daily employees, students, and visitors. Many faculty, researchers, staff members, and students routinely visit our campus both throughout the week and on weekends; therefore, parking regulations must be enforced on a year-round basis. The Brazos Garage (BRG) will experience heavier than normal traffic during the six weeks of Freshman Orientation. Traffic in and around the BRG will be at its heaviest on the first and last day of each orientation session when the attendees are entering and exiting the garage. We will have staff directing traffic. Please follow their directions. They may ask you to enter at another entrance because of congestion, to continue driving higher in the garage, or to park in a particular space in order to maximize the utilization of the available parking spaces. Failure to follow their instructions may cause accidents and/or more congestion in the garage. Please note, parking in the other garages is on a first-come, first-served space available basis. Departure: We highly recommend that you DO NOT exit at 5 p.m., as there will be very long wait times to exit the garage into surrounding rush-hour gridlock traffic.